1980’s fashion was so adventurous for males. Thank goodness for an 80’s revival! Guys everywhere are sporting the “ironic 80’s” look, complete with popped collars, pink polo shirts, checkered Vans slip-ons, and longer hair with lots of body. Although they arguably never went out of style, guys are also looking good in vintage Members Only jackets, tall striped socks and 80s Chuck Taylors. MJ’s red Thriller jacket and white blazers paired with pastel 80s tees are always popping up at retro themed parties and clubs, too. There isn’t much Flock of Seagulls hair going on, but hopefully the severely asymmetrical Tony Hawk-of-the-80s haircut will become popular again. We’re also hoping we see super short tennis shorts on dudes this summer! Whether you’re looking for an 80s costume to attend a themed 80s party, or just some 80s-inspired retro daily wear, you’ll find them in the same places. Depending on where you live, thrift stores are usually the best place to locate 80s style clothes, accessories and anything else from that time period. If your area doesn’t have a very good selection of resale shops or you don’t like spending the time and effort scouring through the racks of clothing, eBay is THE place to shop. 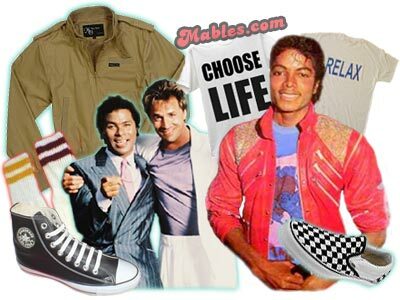 Many people make their living searching for rad 1980s clothes and selling them on eBay, so the selection is always really good and the prices are competitive. Just tease yourself an awesome 80s hair style, get some 80’s clothes for your woman, and you’re all set! Looking for a super easy 80s costume? Grab your favorite 80s costume t-shirt and enjoy the flashback!